Summer of 14ers, 2016 | ride. travel. live. 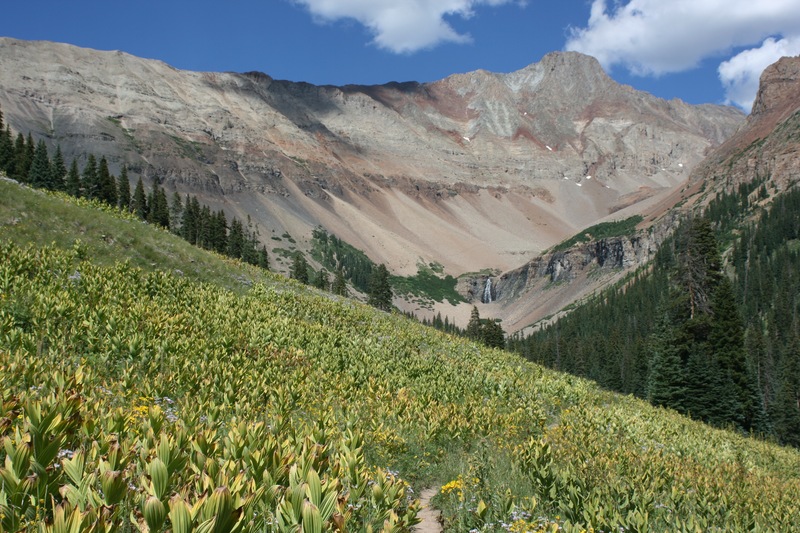 My slow path towards summiting the Colorado 14ers continues. I have to admit that I burned out a bit on the driving and hiking, and pretty much stopped after August. 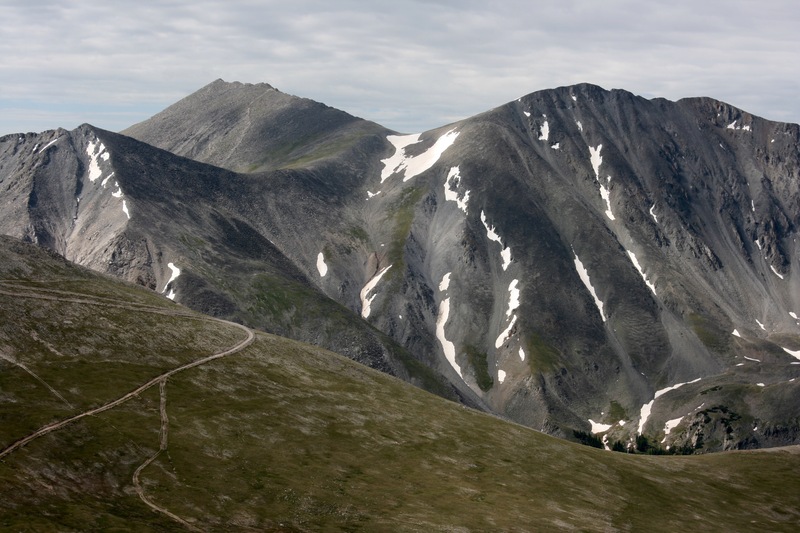 This year’s peaks were mostly in the Sawatch Range, the bread and butter of the 14ers. They’re all about the same, with the exception of the Harvard / Columbia combo, which was the near-disastrous finale of the set. I failed to find a regular partner for the hikes, overall, so most of these were solo efforts. My season started with a late June ascent of Mt. Princeton, which is normally a long slog from the bottom. But after starting on the trail nice and early before sunrise, I caught a ride in the back of a truck. This took me well beyond the radio towers to a spot about a quarter mile from where the trail leaves the road and heads off towards the peak. It’s an endless talus field, and not a lot of fun to hike, but as always, the view and accomplishment make it worth it. So the elevation gain was a very reasonable 3000′ or so, including my detour up the nearby 13er Tigger and back down to the trail, where another fellow gave me a ride back down. Across from Mt. Princeton is the imposing Mt. Antero, which I hiked the following week. This was another uninspiring hike, and this time I didn’t catch a ride up, so I was stuck hiking the entire 15-16 mile round trip. 90 % of it is a road, with the last part a scramble up to the peak. This peak sees a lot of gem hunters and ATV traffic, which somewhat diminishes the experience. But the wildflowers were blooming and the lower stretches were very green. 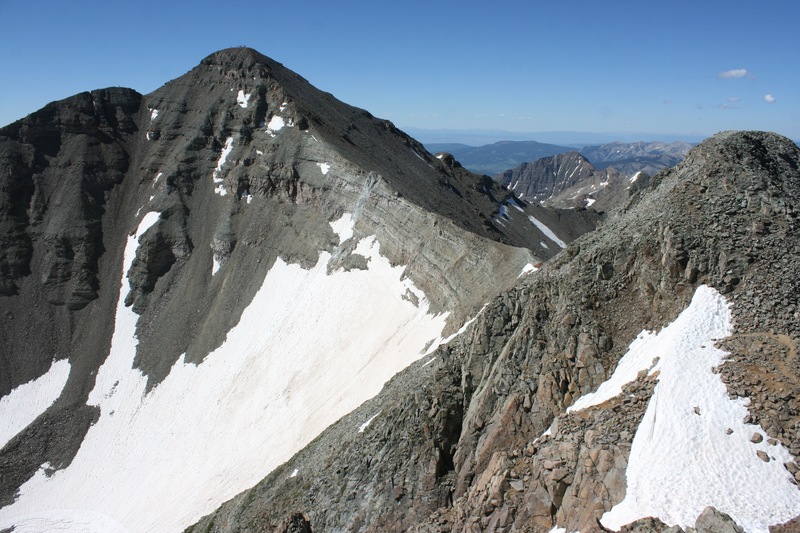 The peak really is one of the most beautiful in the Sawatch, burly with a delicate pointed summit, but the natural environment is looking rather worn out from all the human activity. I moved over to the Elks the following week, and made yet another trip up Castle Peak, this time taking the ridge further over to the summit of Conundrum. This was made a bit easier by a driver who gave me a ride uphill, saving me about 500′ of elevation gain and a bit of distance. But the talus fields were pretty awful, and there was the usual scrambling to the summit of Castle. This time I had the energy to continue, and then re-summit Castle, and the weather was clear the entire day, thankfully. My next two were Massive and La Plata back in the Sawatch. Neither was too busy on the days I hiked them, although the trailhead for Massive is shared with the one for Elbert, making for a very congested, noisy, and dusty start. That area gets a massive amount of people, but it looked like about 80 % of them were headed for the Elbert summit. 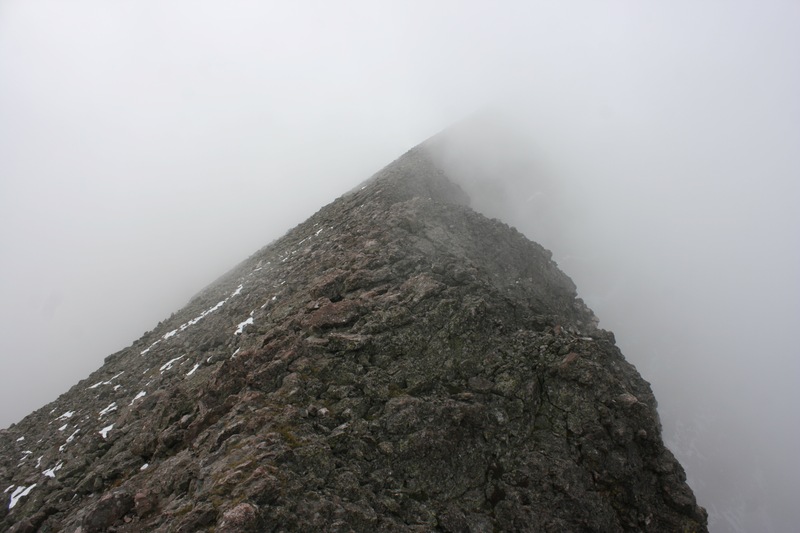 The trail to Massive is just rather long, with a long section above 14000′ that continues well past the summit. I was intending on going up South Massive, but somehow looking at the climb back up, detracted me. I was also seriously low on energy. La Plata is much like Elbert, a relatively short 9 mile round trip with lots of scenery and green valleys and endless switchbacks. It’s flat for the first mile, then really climbs. Further south, Missouri Mountain is slightly spicier than the other ones in the vicinity, with a rather wet, slippery downclimb near the summit that required some care. Since it snowed just before, there was a fair amount of icy spots, but the weather was pretty stable. Overall, it was a cool August with early snow. I attempted the Wilson group next, which was a long drive to the isolated trailhead in Kilpacker Basin. I slept in my car, and started up the very scenic trail. It’s one of the prettiest trails I hiked this year, and was full of wildflowers and greenery and had a bonus waterfall before the climbing began in earnest. I had enough energy for El Diente, which was a pretty extended and thrilling, exposed Class 3 climb to a tiny summit. Wisely, I hooked up with another hiker who was on his own and we took turns on the routefinding and was able to navigate up to the summit. It’s sparingly marked and easy to get lost, and a step up in difficulty compared to my climb of Wetterhorn last year. Going down was no fun, with lots and lots of talus. The remaining peaks in the area will have to wait, so that means another long drive next year for Wilson Peak and Mt. Wilson. 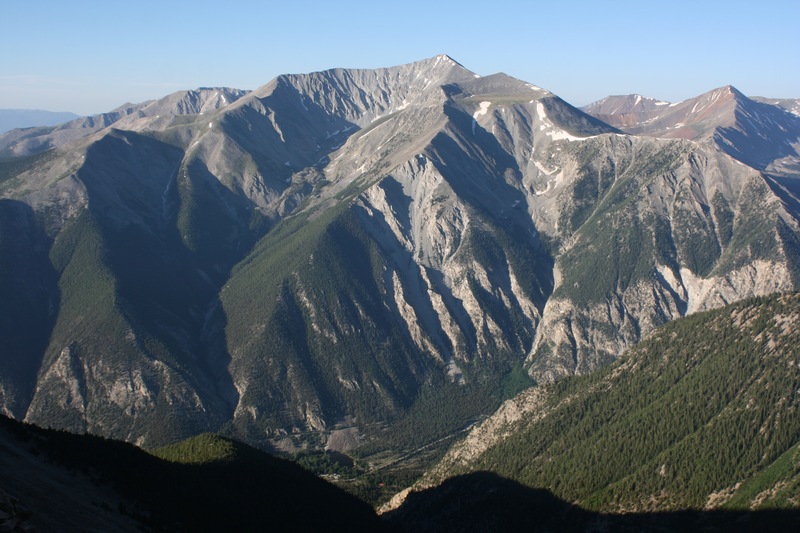 The next two were in the Sangres, two peaks with major elevation gain, Blanca and Challenger Point. I wanted to go up Ellingwood and Kit Carson, but my energy didn’t permit it, and the weather on Kit Carson was made more difficult by fog and snow on the Avenue. Blanca turned out to be a monster, since I started just below the 8000′ level and walked up the whole damn thing. The last part of Blanca was a steep, slippery slope with a few tricky Class 2+ sections. Challenger Point was an awful climb past the very beautiful and very blue Willow Lake, pretty much 2000′ of loose crap with no real trail. It was foggy at the top, but cleared enough to catch a view of the Crestones and nearby Kit Carson Peak. After returning from Brazil and being out of shape, I got together with a friend and attempted the Harvard / Columbia traverse. Despite the cool temperatures and clouds going in and out all day, we summited Columbia first. The climb up was a mixed trail / scree scramble. It’s notorious for being awful, but the new, partially finished trail was a real help. Getting over to Harvard was problematic, as my partner went way ahead and inadvertently ended up in Class 5 stuff, and I lost track of him. I made it to the saddle between the peaks, took several wrong turns, slipped in a loose gully, and then it started snowing. This was the worst possible place for it to start snowing, as now there was no easy way out and I basically had to summit one of the peaks again. After waiting out the snow, the weather cleared up long enough for me to slowly make my way up the slopes towards Harvard. My goal was to get to the main trail and to treeline before dark. I skipped the true summit, and made my way down another scree and talus slope and eventually made it to the trail. The cold and distance and elevation gain had worn me out, and I didn’t make it back to the trailhead until past 8 PM. Luckily my friend had gone back up the trail looking for me, and we met up about 3 miles from the trailhead. We were both fine, but a lot of things didn’t go right. So that was my summer! Would love to hike one of these. To date, I’ve only done two of them by car.